The average price of diesel fuel in the U.S. remained mostly flat last week after more than a month of increases, according to the latest Energy Department numbers. The price of a gallon of on-highway diesel fuel increased by 0.2 cents last week, raising the price to $2.121. The price is still more than 70 cents cheaper than it was for the same week a year ago. Prices increased or decreased by small amounts in most regions with the largest increase occurring in the Rocky Mountain region at 3.8 cents. 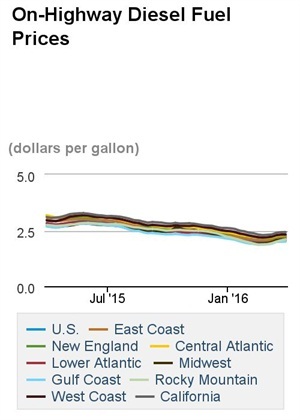 A few areas saw small decreases in the price of diesel fuel, falling by as much as 1.3 cents in the Midwest. Gasoline prices were more volatile in the same period. The average price of regular gasoline increased by 5.9 cents nationally, jumping to $2.066 per gallon. This is the second straight week that average gasoline prices have remained above $2.00 per gallon, but the price is still 38.2 cents cheaper than for the same week of 2015. The largest jump in prices by region was an 11.2-cent increase in New England while the smallest increase was 1.8 cents per gallon in the Midwest. Crude oil prices fell over the holiday weekend as the market remained wary of recent gains, according to a CNBC report. Prices have increased in recent weeks on reports that oil production was being reduced. But there is still more supply than demand globally, with some analysts believing that production might actually increase in the short term.